Standing on the middle of the Saskatchewan Prairie it is almost as though you can feel the history of the place. Close your eyes and visualize a young bride pulling into the yard escorted by her father, the nervous excitement gripping her body. Or sense the energy of children rushing by excited for a Sunday visit. The joyful chatter of the annual Bizarre reverberates from the basement. The few cracks in the foundation aren’t wrinkles from strain they are the laugh-lines of memories shared. There is also the sense of tears and sorrow lingering from the near century of mourners who have descended the front stairs of the church and proceeded to the cemetery on the grounds. 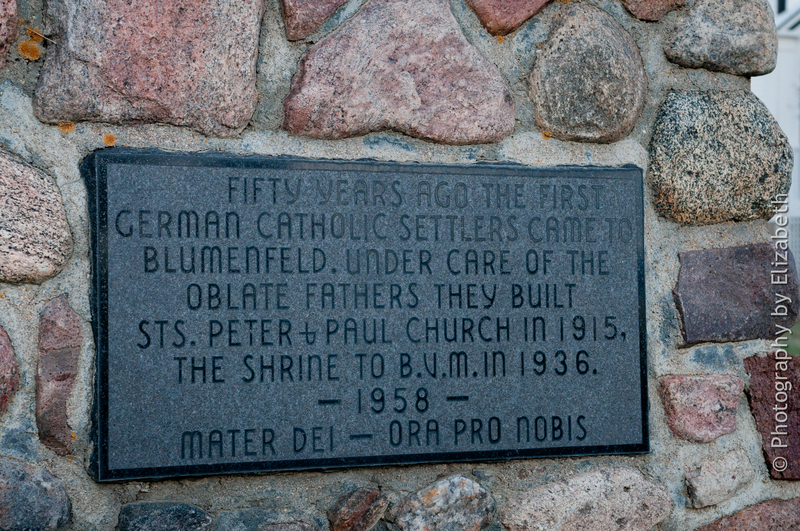 This place is the Blumenfeld Heritage Site located 16 kilometers South and 6 km East of Leader just off of Highway 21. 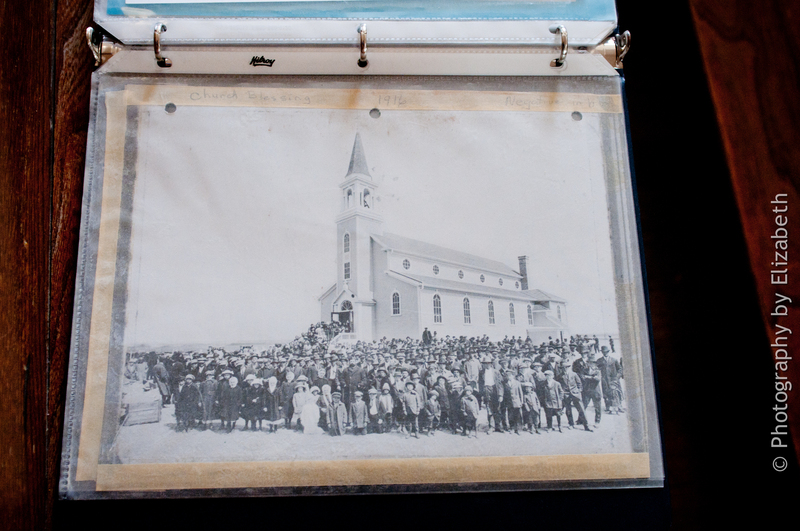 The Church’s records go back 100 years to March 17, 1912. 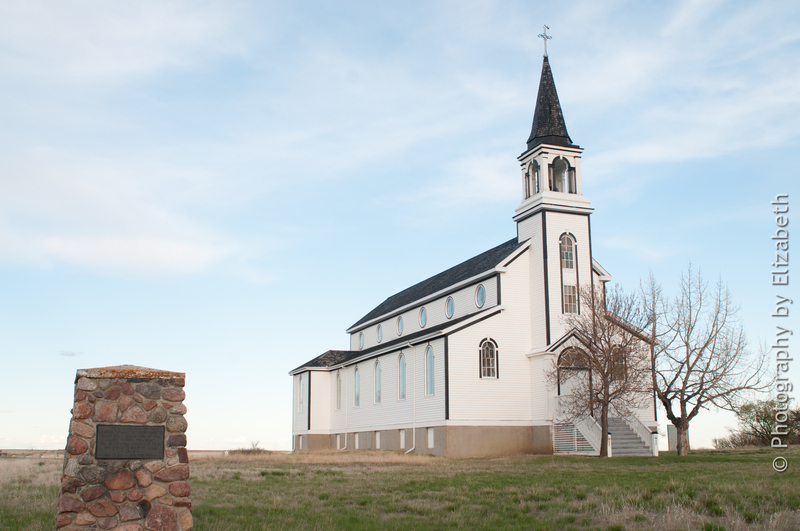 They are among the first official records to document the early years of settlers in the area and tell the story of what was once a thriving rural parish. The following are snippets taken from at history of Blumenfeld written in May, 1955. 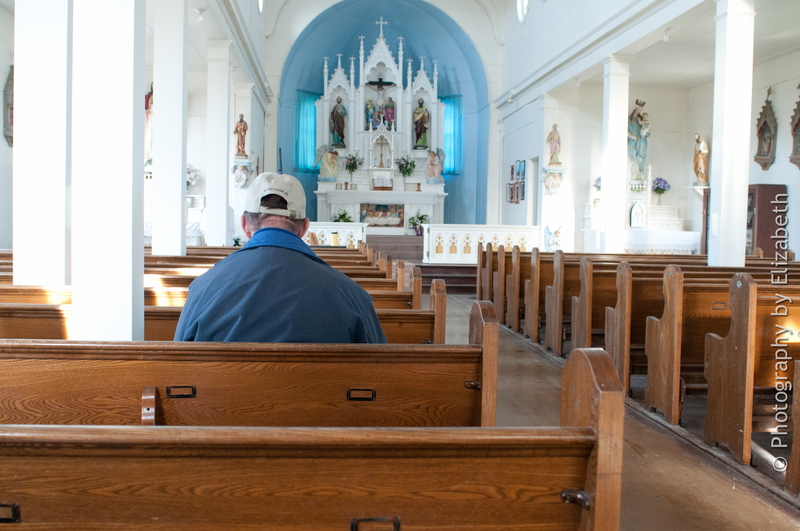 Less than a half century from the time the first settlers arrived and nearly half a century ago the author of the historic account begins lamenting the “urbanization” of the parishioners. “In speaking to some of the old Timers, they refer to the year 1908, when the first Catholic settlers arrived in the district of blumenfeld,” begins the author. The early German settlers came from Romania, Krasna and Bessarabia. Some of the original family names to the area are Hoffart, Guckert, Duchscherer, Drescher, Ziebert, Riffel and Weisgerber. In the early years of the Church, between 1912 and 1955 – “the remarkable figure of 1740 baptisms” were registered, accompanied by 254 marriages and 295 deaths. In 1964, less than 10 years after the writing of the early history, the Blumenfeld Parish celebrated its last regular Mass. “I remember where a lot of people sat,” Tumbach reflected. He as recalled the winter chill in the parish heated by two large registers at the front near the alter fueled by coal-burning furnace. “My dad and I drove up here for Christmas one night, it was colder than hell, we drove up with the horses and bobsleigh,” described Tumbach. “There was a chandelier, hanging right down the middle. It was about 10 feet around and with green balls and lit up with candles.” The Chandelier is now gone and only a memory. 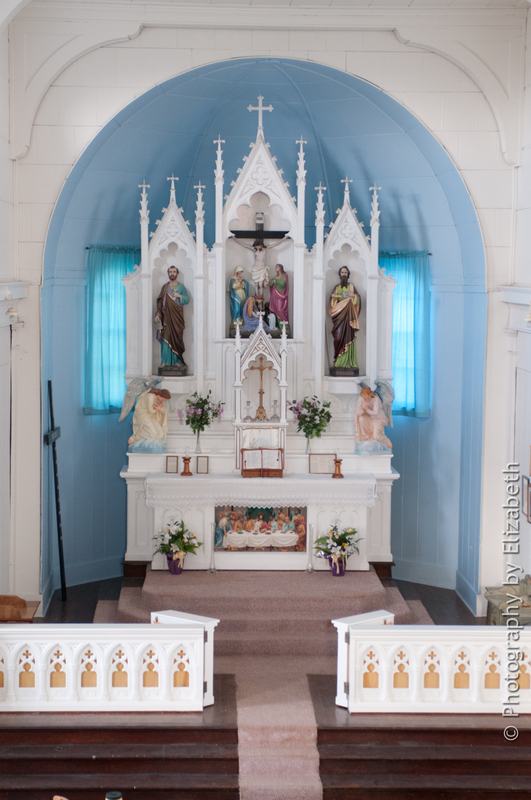 Today, local volunteers care for the site and give tours of the church on Sundays in July and August. Other than the annual pilgrimage in June it is only used for the occasional wedding or funeral. Nevertheless, the parishioners worked to build a place of pilgrimage hauling in rocks from miles around the site. On 1936 the Grotto was blessed for the first pilgrimage. The lament of Tumbach nearly 50 years after the first historical account sounds familiar. It has been the lament of rural Saskatchewan for years. The committee of volunteers continues to work at maintaining the site, a few years ago the windows on the Northside of the building were replaced for $23,000. It is hard to believe that they original church, complete with a basement, cost just over $10,500 to build, and the rectory a meager $1200. Drive South of Leader or West from Liebenthal on Highway 21. Turn West at Blumenfeld Road (You will be able to see the church’s steeple in the distance directly West. Once you have turned, simply drive about 4 miles until you arrive at the church. (It really is that simple). I have attached a map of the Great Sandhills, which are in the same general area. The Blumenfeld Heritage Site is located at the Red Pin. Good to Know: The church is open to tours on Sundays in July and August from 2:00 to 4:00. You can stop in and explore the grounds at any time. Make sure you take a tinkle before you visit the heritage site. There are no washrooms on the premises. 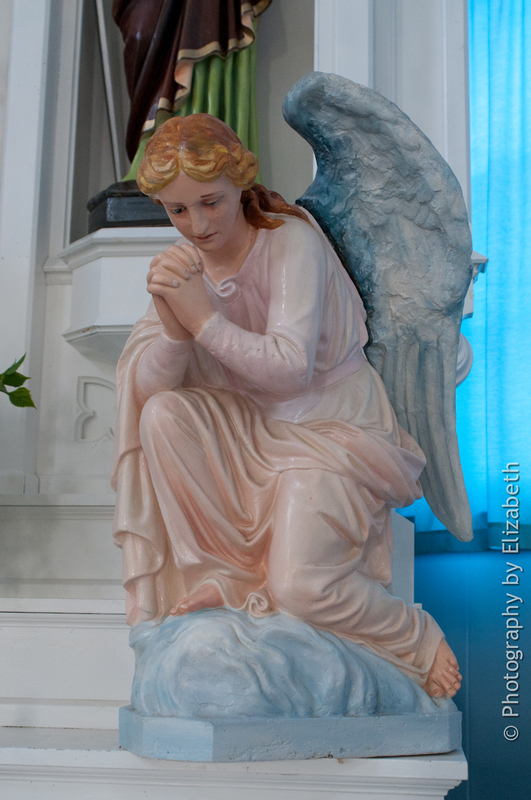 Thank you for the article and photos on Blumenfeld Church. My mother’s parents arrived from Bessarabia in 1908 and settled south of the church. 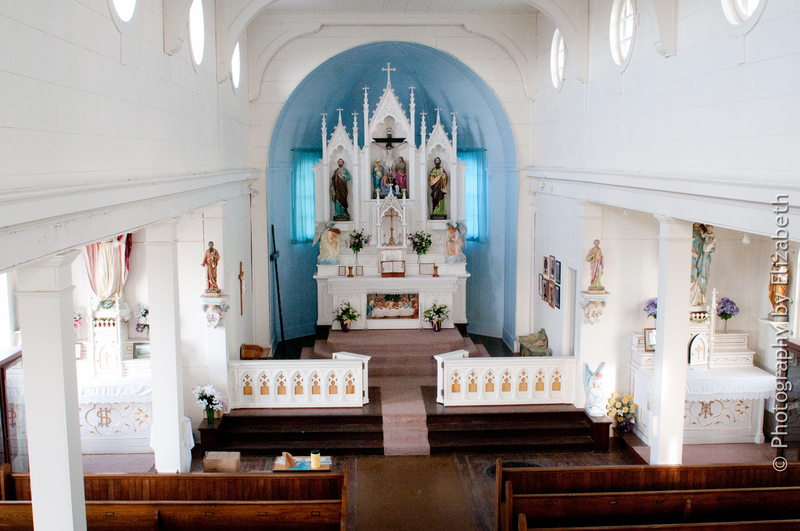 My parents were married in the church and I recall going on the annual pilgrimage to the site. Yes, unfortunately, there are few remaining small farmers in the area as large corporations have bought up most of the land. Farm buildings are left vacant and the newer homes are rented. 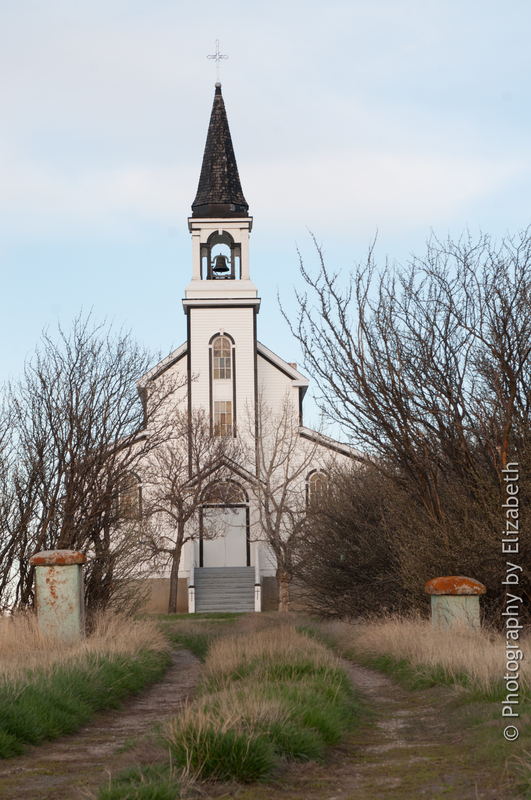 The church still sits proudly but in isolation on elevated land as a beacon for travelers. .
Hi Lacy – hopefully Michael gets back to you! I am in the process of making a family history book and one set of my Great Grandparents were from this church (Bespflug) and buried in the cemetery there, and another set of Great Grandparents were in this general area (Heck). Would I be able to get a copy of your book and see if I can find more information for my own search. 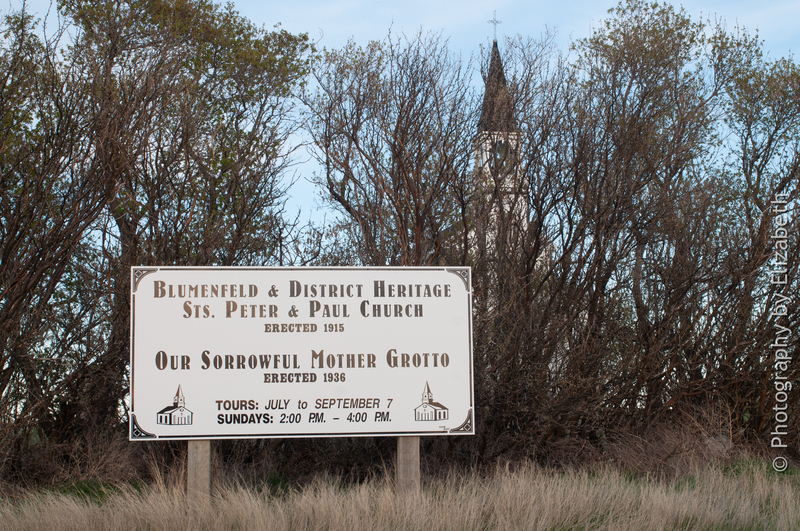 I follow the Blumenfeld & District Heritage Site on Facebook as well. Bonnie, can you please email me at: lacystrutt@gmail.com. I can send you some more information on ordering a book, thank you. Hi, I’d like to share this again or tag it again for Blumenfeld and District Heritage Site. I’m on the board along with Lacy. Richard Tumbach, in the photo was my Dad.